I spotted this monkey's fist on the Victoria Clipper. 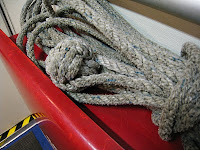 The knot is used to weight one end of a haul line which is then used to drag a larger mooring line from ship to shore. Knot craft is a sign of real sailors.